The MOD-1A1 module has 1 current analog input (0~20mA, 4-20mA, -20~+20mA) and 1 voltage analog input (0~10VDC; -10~+10VDC, 0~1VDC; -1~+1VDC). Both intputs can be used at the same time. The modul is equipped in one configurable digital output PNP or NPN type. Digital output is activated when the value exceeds the setpioint or dropped below the setpoint. 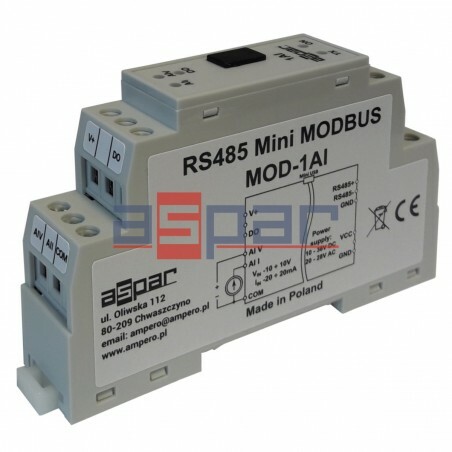 Setting the output current or voltage value is done via RS485 (Modbus protocol), so you can easily integrate the module with popular PLCs, HMI or PC equipped with the appropriate adapter. 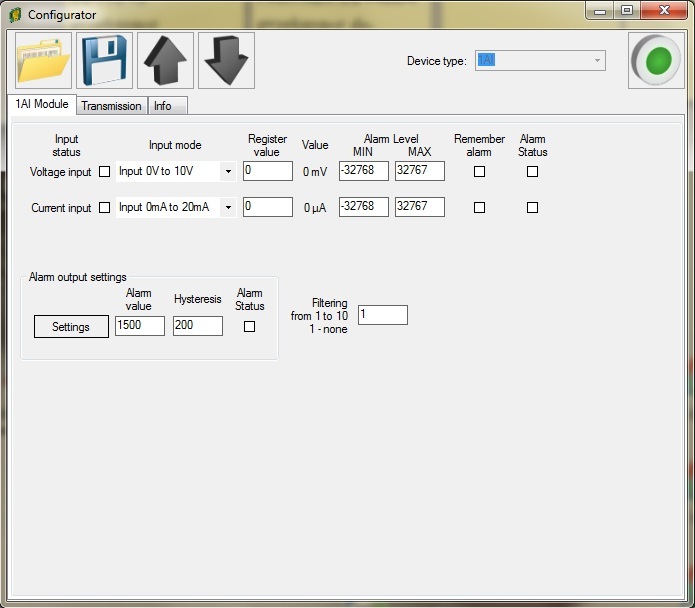 The module MOD-1AI communicates with all commercially available PLCs and other devices that support popular Modbus Master protocol. The module is designed for mounting on a DIN rail in accordance with DIN EN 5002. The module is equipped with a set of LEDs used to indicate the status of intputs digital output useful for diagnostic purposes and helping to find errors.